All I know about this photo, is what it has printed on it, Rose Cottage, Feniscowles. Does anyone recognise the house, know where it is and if it's still standing? My date is only an estimation, based on the clothes the women are dressed in. The house still stands, and is situated at the very top of Pleasington Lane in Feniscowles. It is currently called Sun Cottage and is up for sale at the moment. (March, 2013). Hi, I'm not too sure that this property is the one on Pleasington Lane. 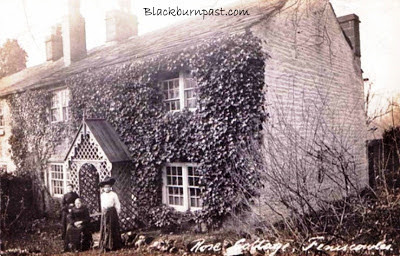 It looks very much like the cottage that used to stand opposite the Horden Rake (across the road,up the ginnell & in the 'bottoms' with the old railway embankment to the left of the cottage (as looking at the photo). It was at the bottom/side of our rear garden of our new house in Langdale Road (bottom of the culdesac) when we moved in 1961. Our neighbour at the time in the bungalow next door was Mike England (the footballer)- his back/side garden backed onto the railway embankment & the cottage. Our rear garden was 'made up' with a retaining wall to the level of the bedrooms of the cottage. The cottage has since been demolished along with the embankment to make what is now 'Coverdale Drive'. I really don't know this area, so I'm completely reliant on others info. The property still stands at the top of Pleasington Lane in Feniscowles. This property is still at the top of Pleasington Lane and for many years has been known as Old Sun House. Rose cottage adjoined another cottage called Ivy Cottage and the two properties now are one. The former Rose Cottage was a pub in the 1800's called the Old Sun Pub and it is strongly rumered that Lady Hamilton (mistress of lord Nelson) used to stay in the pub. There is some credibility to the story as Nelson's number 2 in the navy was the eldest son of the De Houghton family and when he visited him, Nelson was not allowed to take lady Hamilton with him. We also out of the blue today had a visit by a couple whose Great grandmother used to live in Rose Cottage. Apparently, she kept a birthday book which is now owned by her mother and in there - for whatever reason - is the name Horatio Nelson! It is true the house is now for sale and we are the current owners! Very interesting. Thanks for the additional info. Rose Cottage was the home of my great grandmother. It is very much still standing and called Sun Cottage after the house was converted into the Sun Inn. Its on Pleasington Lane just at the junction. Thanks for the info Maisaway. I only have a copy on a pen drive, ie, I don't have a hard copy any more. Nor do I have a printer. So if you can't download the one on this blog, the only way I could get the image to you, is if you supply me with an e-mail address that I can send it to. Your e-mail address wont be published on here. All comments have to be published / approved by myself before they appear on here and I just wont approve it. Once I have your e-mail address, I will send you the image (without the Blackburnpast logo) and once I've received acknowledgement from yourself that you have received it OK, then I will just delete the message with your e-mail in it. You have my assurance that it will not get published on this blog. I have now sent a copy of the image to your e-mail address. Have a look in both your In box and your Spam box, in case it ends up there. If you have received it OK, please reply then I know you've got it, or leave a message on this thread. Does anyone know what year it (the old sun house/rose cottage) was built and by who?